[IC] Girldc's keycaps - Show your support! 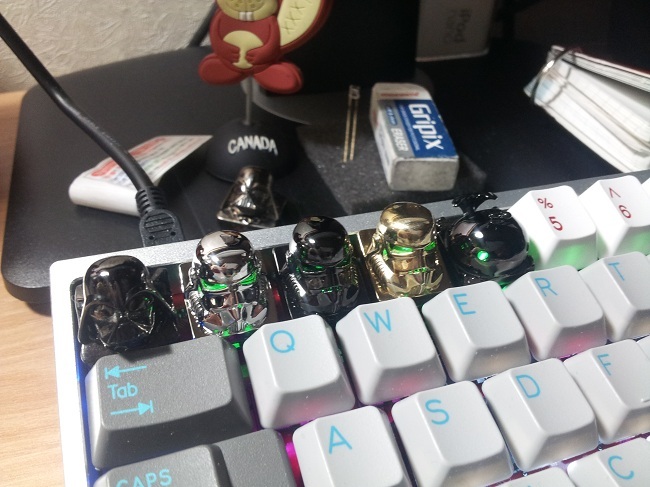 Im a relatively new member here on geekhack who joined after lurking for a while, hoping to start a collection of artisan keycaps. It was Girldc's ironman that lured me into this world of custom keycaps. However, after joining I soon found out Girldc was prohibited to conduct any groupbuys/commercial sales on geekhack. Fortunately, I got in touch with Girldc outside geekhack and he was kind enough to let me in on groupbuys conducted on other foreign communities. Since we were both in the same country I was able to deal with him directly. When I asked him what happened on geekhack, he directed me to threads referring to the events of REDLINE, along with answering every questions I had about it. From a third party prospective, this was unfair. It was Girldc's sincerity that convinced me his passion for his artwork was beyond fame and profit. Besides tarnishing Girldc's reputation, the REDLINE incident has greatly limited his passion for this niche genre. Im here to ask for your support to lift Girldc's prohibition on geekhack so he can spread his work to everyone here. Due to the language barrier, something that restricts emotions or lead to misunderstandings, I am willing to translate for Girldc and the geekhack community. I have messaged two different moderators here about the situation and received no response, so please help and speak up. Whether you had the chance to deal with Girldc yourself or if you are interested in his work, now is the chance. If this works out, I am going to ask Girldc for a small project with a low cost and a small MOQ. All in hopes to restore his reputation and reinstate his position as an artisan keycap maker. This is only an interest check and nothing is set in stone, but Girldc still shows interest to continue his work on geekhack and we can help. Due to recent revelations, we have finished our deliberations and decided that the following actions need to be taken, effective immediately. LifeZ and girldc are no longer allowed to conduct commercial business on Geekhack.org until further notice. we will archive this vendor subforum in 48 hours. this thread will be moved to announcements. the remainder of the subforum will be archived. Our hearts go out to those in the community. As the coach of the beleaguered LA Clippers said recently, we hope these actions allow the healing process to begin. 최근의 폭로로 인해, 운영진은 심사숙고 끝에 다음의 액션을 즉시 시행하기로 결정하였습니다. LifeZ와 girldc는 긱핵.org에서 추가 공지가 있을시까지 상업적 활동을 금지한다. "If you are violate this directive, and are found to be doing business on geekhack, you will be subject to punitive action including but not limited to permanently being banned from geekhack"
만약 이 지시를 위반하고 긱핵에서 사업적 활동을 하게 된다면, 영구적인 추방을 포함한 징계가 따를 것이다. Disclaimer: This is not a commercial business plan, merely an interest check for the possibility seeking for support. If this works out I will not be the middleman just a translator, all transactions will be handled directly by the artist, unless otherwise requested. Re: [IC] Girldc's keycaps - Show your support! I thought girldc was allowed to sell caps here after further review. I thought I read this too, but I don't think people relayed that info to GirlDC. I remember reading some of GirlDC's posts and his grasp of english isn't that great. Someday somebody will best me, but it won't be today, and it won't be you. Can I get a link please? I couldnt find anything on the announcements board, nor could I find it in the search engine. My work internet is acting up and I can't find it. It took me about ten minutes to post this . In a google search. That's what I use to search for things here. Here's one of the threads, it may be useful. I support this completely. It's not fair these two great creatives should be stopped from sharing & selling their work here, just because of the actions of their associate. They've done countless group buys successfully and with no issues since the DSA Dolch scam. Doesn't LZ still have a mostly undelivered GB? The LZ-GH or something. I'd love to see GirlDC back, but LZ stillis on the **** list until they deliver. GirlDC has never had any issues of not delivering or not making thing right that I know of. That's because of alaricljs, not LZ, afaik. LZ delivered everything. Alaric then just didn't assemble people's boards/held stuff forever. Just like wfd/profosist. I purchased a few of Girldc keycaps. Does he have a mailing list or something to get notified of new stuff outside of Geekhack? Man, I love the girlDC keycaps. 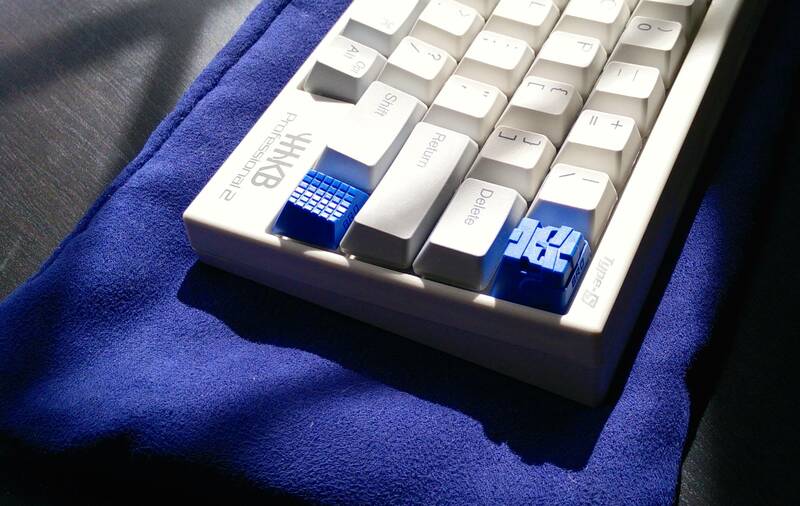 His Stormtrooper is one of nicest keycaps I have ever seen. I just wish he made Topre keycaps as well. I'd love more of GirlDC's caps; I was on hiatus for a lot of what's happened so I can speak to that though. In favor of GirlDC's return in some form, he's historically always delivered and been responsive to messages. GDC is definitely allowed to be selling his caps on here, and I think he's even started again. GirlDC is good in my book! Always came threw or would let us know of delays. Yup, never had anything but positive experiences with GirlDC. I miss his caps. Indeed, thanks for the clarification. I havent got the chance to deal with LZ but if need be Ill try to contact him, if not ask about him. Please show your support for him to come back and hopefully the moderators will have another look into the situation. Those who delt with him knows he follows through and always deliver. Even when he was late on a groupbuy order he added a space panda to express his apology for those waiting (extra time + cost.. who does that? serisouly?). Girldc will be pleased that members here still support him and want him here. Lets make this happen and bring him back. Im sure he has tons of ideas caged in for us! If this spans out, I am planning to push the idea of topre keycaps to Girldc. 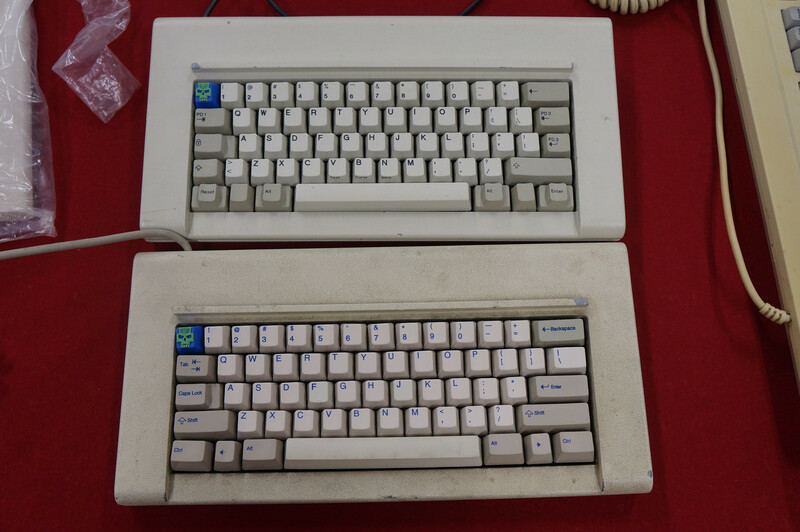 Topre seems bigger here than other foreign keyboard communities, so if he can work in geekhack he should be interested to hear our opinions. Topre stormtrooper? Not to get anyones hopes up.. but I would personally really like to see a white plastic stormtrooper, since his metal works are restricted to 4 colors (theres a picture of him working on a blue plastic C3PO). He is continually working on new keycaps but not for this community due to his current status (quote in OP). If there is a post that states otherwise please let me know so I can forward it to Girldc so he can conduct "commercial business" on geekhack. I just dont want to misinform him and make him face a permanent ban here. Again, if a mod can chime in just to clarify his current status thatll clear up this confusion. Who say's we're not receptive to that? We love that stuff here (or at least I do)! I'm not really sure of girldc's status but if he is in fact barred from selling, I'd support a petition to reinstate him. I'm in, I don't own any of his keys but I'd love the chance to buy one. Especially if I can get a ghost. I'd like to see more from him. Neat stuff. Just so everyone knows, this is on our radar and will be reviewed ASAP. Feel free to continue expressing your support for GirlDC, I just wanted to chime in and mention that. Not my position to reveal his upcoming projects, but I can say Topre is in his mind. We just have to show our demand for it here in geekhack and push it forward making it a priority on his list. Of course, if all goes well and he is able to supply to geekhack. Thanks for the support and love <3 Hopefully girldc can stop by soon to show his gratitude. bowji pm-ed me earlier today because he noticed that I had voiced my support for LZ in past posts and asked me to express my support for these two exiles. Note: I was in the redline GB for the DSA dolch and I did lose money because of that d-ouche bag druger and I sincerely hope that he one day slips and falls and breaks his coccyx because that sounds painful and he deserves it . That said, I certainly understand the temptation to hold GirlDC and LZ accountable for druger's trangressions but I can see absolutely no logic in doing so. 1. Was redline required to sign some sort of collective agreement, prior to and as a condition of GH's provision of a vendor site, that stipulates terms covering what to do in the event of an a**hole like druger? I'm not trying to be tricksy here: it's just that druger reached a new level of assholishness here and I think that we were as unprepared for it as LZ and GirlDC were. In this regard, their continued exile seems a bit excessive. 2. Never during the dolch dsa GB did I nor was I asked to pm or get approval from LZ or girldcc. this was a druger thing from the get go and the separation that seemed clear to me last year is even clearer now. 3. prior to the druger fiasco and also since then, it sounds like LZ and GirlDC have continued to act in good faith. 4. some people replied, when I first tried to defend LZ, "yeah, he did take forever to deliver the trik FW update." (2. ): Druger happened to be an a@@hole who used LZ and GirlDc for their reputations for his own crimes associated with his GB. (1.) LZ was loosely affiliated - certainly not in any legally binding sense with druger (an unkown evil a@@sis hole) at the same time he was loosely affiliated with GH. (4. ): LZ also didn't update FW as quickly as he might have. If you can accept the fact that Druger was to blame and that he actively misled LZ and GirlDC, etc then it seems that LZ is banned because he didn't update the FW fast enough and just happened to be in the wrong place at the wrong time. I think his banishment is excessive, reactionary and without merit. sure he could do some things better/faster... but WTF?!. Nobody's banned Sherry - they shouldn't - and he can be much less timely than LZ. I think LZ has paid enough for druger's crimes. Invite him back! i'm not sure how much anyone else could do to show good faith. to be frank, there are people who have done less that are still priased and accepted here. Girldc honestly makes some of the best artisans that I have seen. Thank you for sharing your opinion about me. Even though I was prohibited opening GB, my works of keycaps is on going. Since the last GB, 3 new keycaps was produced but i had no sales channels to display them to you. I madly enjoy making keycaps. I love to design keyboard which i spend a lot of time with. So whenever I make a new keycaps, almost always I use it to make myself satisfied first. When Redline accident happend, I concentrated on studying. To make better keycaps, I studied design for about a year. And one of the Geekhack member told me that bad story. I wanted to find out the whole story but it was too late to get in touch with them. and did something that I could, but language is the big problem. Still I am not sure what I wrote translated rightly. I am the person who think 'promise' and 'trust' is most important. That is very important things like me who cannot communicate well. For that, I use more expensive delivery system to get the information of my product status before it reaches to the customer. Another thing is that I send mails with photos to the customer to show the status of their products.-it is this much on going like. Because of redline accident, I spent a lot of time to talk to other people so my last works was awfully long delayed. So I sent e-mails to each customers and attached another new keycaps for waiting. That is all I could do at that time in my situation. I hope a lot of people enjoy my keycaps. Now ‘keycaps’ becomes my important business. And I start it from here, this site where is many keycap lovers and people who love my keycaps. My keycaps is not normal toy. It represents me as an artist. Each one I put my soul and for that I studied a lot. and hired overseas marketing worker. I am ready to meet you guys now! To me, the trust of Geekhack members support me most. I am truly glad to see that you have made an appearance. The language barrier is definitely a problem, however you have good communication still. I can understand what you say perfectly as well, even though there are some errors. I hope to see what you come up with next! Great to see you're back, I can't wait until I'm able to snag one of your caps! I still want one of your space marine panda caps GirlDC. Thank you so much for a fresh and detailed perspective from someone directly affected by the tragedy. I can only imagine the anger that was caused by that Jackass, yet you still voice out your honest feelings towards LZ. In no means is that an easy thing to do, let alone look over the fact how they were associated through REDLINE. I respect that. Im guessing you were one of the lucky few who received Girldc's space panda. The one time I wouldnt mind getting an order late... I appreciate you vouching for him. All keycap artists here has their perks, its just that Girldc sticks out as a jeweler with his detailed craftsmanship. Its doesnt matter if you dealt with him or not, we're here to show support! Lets keep this ball rolling! 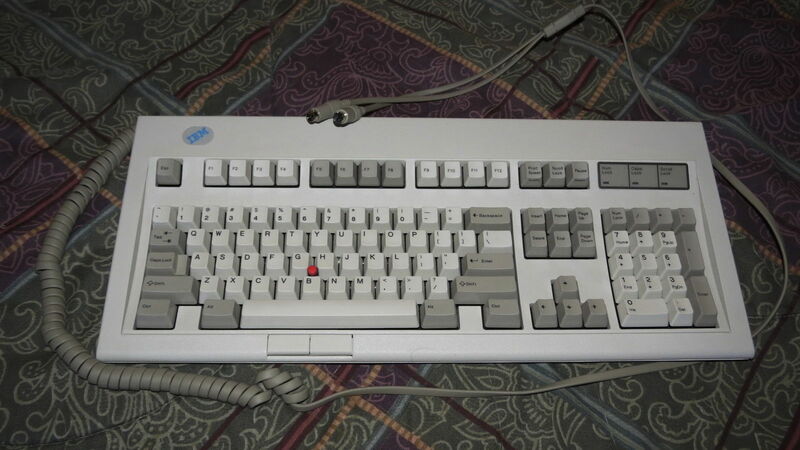 Now �keycaps� becomes my important business. Thank you and one of the S/S collection of 2015 is coming soon! In next you can find images here. 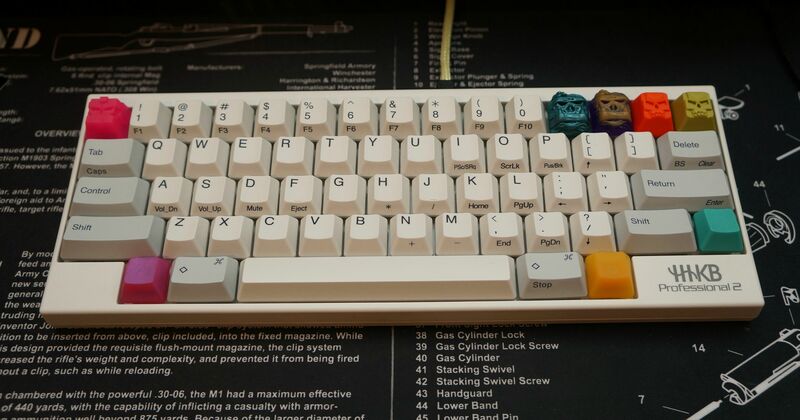 I would buy a Topre Stormtrooper in a heartbeat. That would be awesome. GirlDC, I think your language skills are quite good. I hope you're able to sell here again. I love your caps! While I'm newly registered, I've been following (lurking) this issue for some time. I really don't think that the community here (at GH) holds any real ill-will towards GirlDC. The RedLine debacle wasn't with any problems with GirlDC, and I'd put money on the assumption that most (or nearly all) of us here understand that. Exactly, doesnt seem like theres any ill-will towards Girldc but more of an action taken place due to "guilt by association." Although Girldc was given a chance to speak up, he was too late and the language barrier kicked in. Also, Im sure the community was furious so there should have been pressure from that. I fully support GirlDC's return to commercial business on Geekhack. Personally, and no disrespect to the mods (of which I am personal friends with at least one) I feel this issue has been on the radar for a little too long based solely on what we on the outside know. Just my 2 cents. Let's get the ball rolling here fellas. ^ I think I might pop that into my signature when I'm near a computer. I am waiting for that moment to share my works here! I wasn't around when GDC was selling stuff but i've always been interested in GDC's work and would definitely like to see more! Thank you for sharing your idea about me. It helps me a lot! Thank you! let me free, friends!